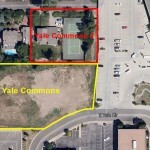 In December 2014, ULC acquired Yale Commons 2, also known as Vassar. ULC made the acquisition to assemble additional land for future development. The property currently contains a house and non operational tennis court. ULC sold the single family home in October 2017. Vassar sits adjacent to the Yale Light Rail Station, servicing RTD’s E,F and H lines. The first phase of the multi-phase development concluded in 2016, with the grand opening of Garden Court Apartments at Yale Station. At the present time, planning is underway for the next phase of development. ULC is working directly with our partners at both Mile High Development and Koelbel & Co.